These caramel candies are made with boiled apple cider and taste just like apple pie! Boil the apple cider in a 3- to 4-quart saucepan over high heat, stirring occasionally, until reduced to a dark, thick syrup, between ⅓-cup and ½-cup in volume. This could take anywhere from 35 to 40 minutes. Meanwhile, line the bottom and sides of an 8-inch square baking dish with parchment paper, leaving excess hanging over the sides. In a small bowl, stir together the fleur de sel and ground cinnamon. Once the apple cider has finished reducing, remove it from the heat and stir in the butter, sugars and heavy cream. Return the pot to medium-high heat with a candy thermometer attached to the side of the pan, and let boil until the thermometer reads 252 degrees F, only about 5 minutes or so. Immediately remove the caramel from heat, add the cinnamon-salt mixture, and stir several times with a wooden spoon. Pour the caramel into the prepared pan. Let sit until cool and firm, about 2 hours. Wrap each caramel in a 4-inch square of wax paper, twisting the sides to close. 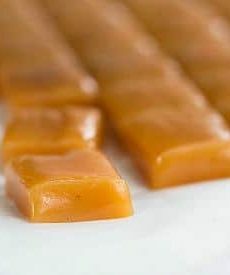 The caramels can be kept in an airtight container at room temperature for up to 2 weeks.